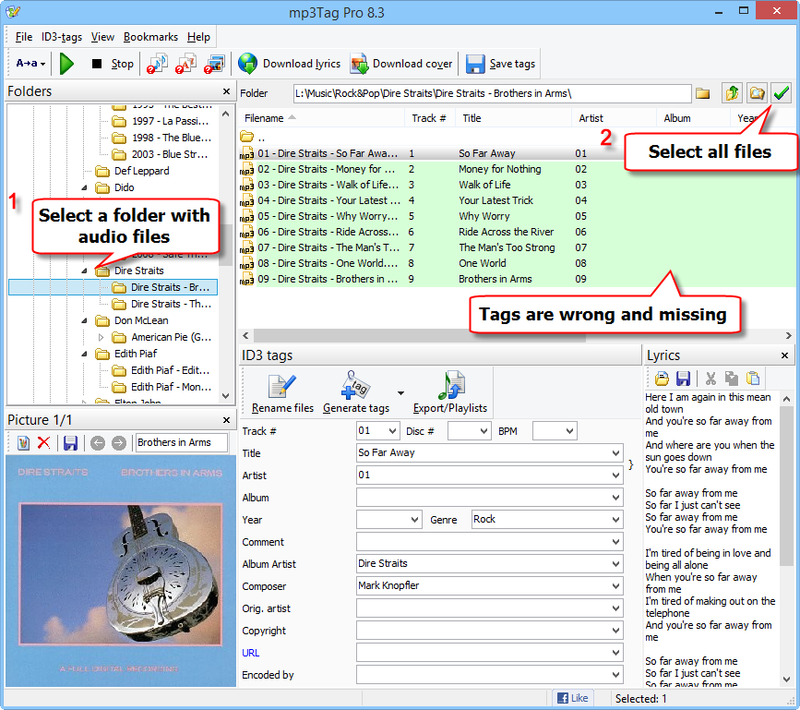 With mp3Tag Pro you can easily edit tags of audio files in various formats. This includes MP3, WMA, FLAC, APE, M4A, AAC, MPC, WAV, OGG, and others. As MP3 is one of the most popular formats, we will use it for our example. Other supported formats can be processed in the same way. While the program can download tags from FreeDB, MusicBrainz, Discogs, or Amazon, extract tags from filenames, import them from a CSV file, and so on, here we will discuss changing tags for a group of files manually. If you'd like to use a different method, just click the corresponding link, or visit the main page of the program for the complete list of features. In the "Folders" area on the left (1), select the folder containing the files you want to tag. Files from the selected folder will appear in the main area (2). This list shows both filenames and information from tags. 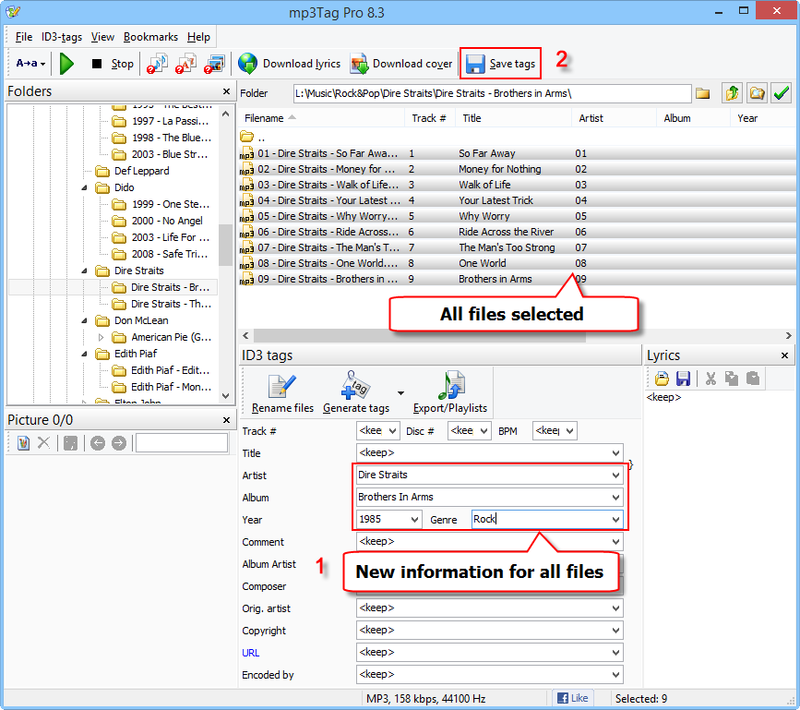 Hint: mp3Tag Pro can also work with files from all sub-folders (nested folders). For an individual file, you can click the corresponding tag field's column directly in the list and edit information as necessary. Alternatively, tags can be edited in the "ID3 tags" area below the list. In this area, you can also edit tags for a group of files at once. 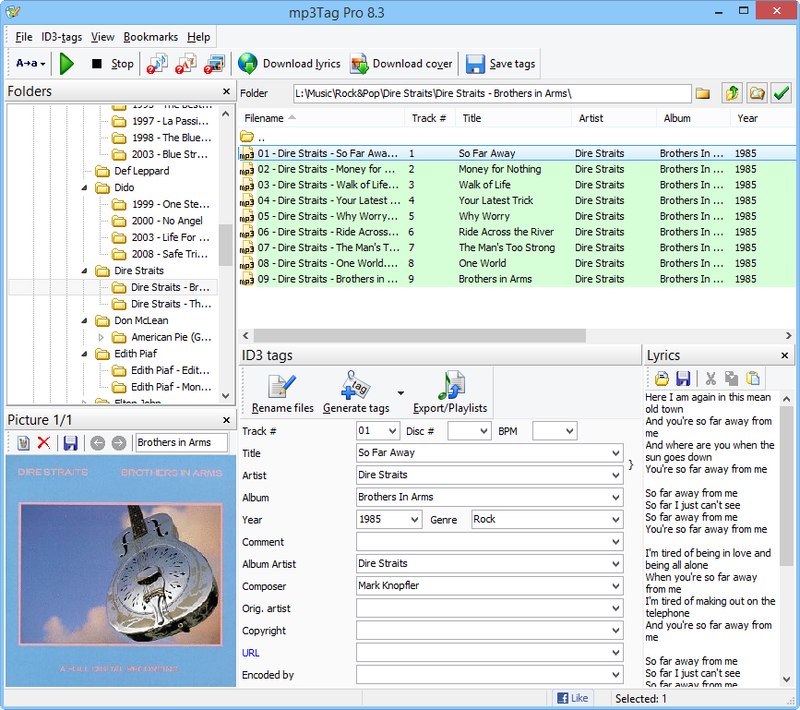 By default, mp3Tag Pro reads and saves ID3v1 and ID3v2 tags, which is recommended. If you set the program to read only ID3v1, only basic fields will be shown. No lyrics and cover art will be displayed, even if such information is available in your files. On the other hand, if you choose to read both ID3v1 and ID3v2, but save only ID3v1, in most cases you will not see any changes after saving tags, as mp3Tag Pro prefers ID3v2 when reading. Our example shows audio files with incomplete and wrong tags. The "Artist" field contains track numbers, "Album" and "Year" are empty. Let's fix this. First of all, we select all files using the green checkmark button on the right (highlighted on the screenshot). In the "ID3 tags" area, the <keep> placeholder is displayed in every field. This means that the program will keep existing values. Let's edit the following fields: "Artist", "Album", "Year", "Genre". We remove the <keep> placeholder and enter correct information, as displayed on the screenshot above (1). When done, click the "Save tags" button on the toolbar (2). Later you can use information from ID3 tags to rename and sort your audio files. For your convenience, mp3Tag Pro can remember everything you type into the tag fields. The history feature can be enabled in the Options window.